If you are looking for an alternative to Bali but still want the beach vibe, Gili Islands can be a great option. The islands may only have become famous among travellers recently but the beauty and things to do are amazing. The Gili Islands are definitely less touristy and crowded to Bali but the attractions and amenities are as good as Bali. 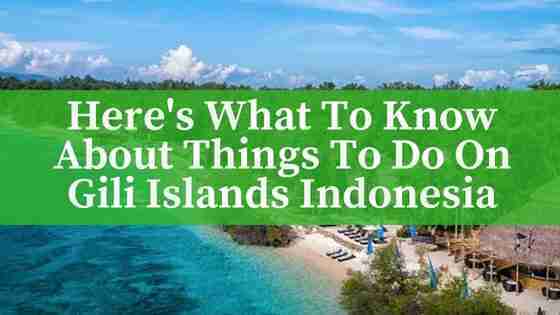 Here are some things to do on Gili Islands for an amazing trip. Yoga and beach are two exciting things to do on Gili Islands. There are plenty yoga studios or yoga on your own by the beach, Gili Island is the perfect destination. 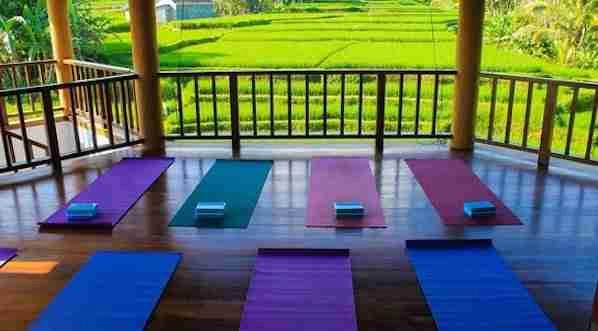 There are loads of daily yoga classes with various styles ranging from meditation to Reiki healing. Finding yoga package is not a problem as there are flyers scattered everywhere on the island. However, you should know that some of the instructor and classes are awful. That is why you need to read reviews on the style, instructor and background before enlisting in particular yoga class. The underwater life in Gili Islands is not something to miss. The islands are famous for snorkeling, diving and also scuba-diving. There are tons of diving and snorkeling equipment rental in the islands. Even if you are a beginner, you can also join diving school before jump into the ocean. Many divers get the chance to see sharks, sea turtles and even exotic wrecks in Gili Islands. One important note when you are diving or snorkelling on the island is not to touch anything living in the sea and also the corals. Let’s just enjoy the stunning underwater life without destroying the nature. Even though surfing is more popular in Bali but Gili Islands is also not a bad place to ride the wave. There are plenty spots that you can try to catch a wave. According to local people, Gili Trawangan is the most famous place for surfing. Another option to surfing is stand up paddling and kayak. You can try the water sport in replace surfing but with the same excitement. If you want to catch a wave, it is also important to never underestimate the possibility of strong currents. There are several ocean swings that can be found in Indonesia and you can also find one in Gili Islands. Some resorts even build their own swings. The combination of swing and sunset is unbelievably stunning. No wonder people are willing to stand in line to get the chance to pose in the Gili’s swing. If you visit the island during peak season, you have to be ready to stand in line on the sunset swing spot. However, if standing in line is not your thing, there are plenty sunset spots on the beach such as beach club and café. You can sit and relax by the beach waiting for sunset and sip some good drinks. That can be said that the sunset in Gili is not something that you can miss. The Gili Island in general consists of three smaller islands which are Gili Trawangan, Gili Air and Gili Meno. Public boats are operated to those islands 2 times every day. You can check the schedule if you want to visit the other islands. If you miss the public boat, you can also charter a boat with affordable price. Mount Rinjani may not be located in the Gili Island but located in Lombok Island. The mount is a famous volcano with a beautiful view. If you have the vibe to mountain trekking, you can try hiking in Mount Rinjani. To reach the top of the mountain, you will need to set a camp for a day or two. Thus, you need to plan the trekking accordingly. Even though trekking in Mount Rinjani is hard, but the experience is definitely worth to try. Starting from 6 in the afternoon, the night market will have any food happy. Located next to the boat pier in the Gili Trawangan, the night market is the place to eat good and cheap food. There are wide ranges of seafood, fresh fish, satay, noodles, rice, vegetable dishes, grilled corn, and many more. If the choice is too tremendous, you can try ‘nasi campur’ which is a kind of Indonesian dish with various type of vegetable, eggs, some meats or poultry, fried noodles, chili sambal and rice. Compared to Bali, nightlife in Gili Island may be more laid back. From the three islands, Gili Trawangan may be the best destination if you aim for night party. There are several party spot and nightclub available. You can also ask the hotel for recommendations. The island may not as busy as Bali but the nightlife and party are also worth to try. Other activities you may want to consider is taking glass bottom boats or take a horse ride to the beach. The beaches in the island are also a great place to simply relaxing in the daytime. If you have the time, you can also try the spa or simple body massage for a really affordable price. The spa in Gili Island is definitely a bit classier and more expensive than in Bali. Gili Islands has a good variety of guest houses, hostels and hotels. Here are a few places to check out and give you an idea of what is available in Gili Islands if you are planning to visit Gili Islands. This property is 5 minutes walk from the beach. Aaliku Bungalows is situated in Gili Trawangan, a 4-minute walk from Gili Trawangan Harbour and features air-conditioned accommodation with free WiFi, as well as access to an outdoor swimming pool and a terrace. Offering villas with sea view, Mallias Bungalows is located on the white sandy beach of Gili Meno, a 15-minute boat ride from Gili Trawangan. Overlooking the beach, all units feature air conditioning and a seating area. Each unit is fitted with a private bathroom with a shower. Offers a tropical garden surrounded by palm trees, Senang Private Villa is situated in a quiet area of Gili Trawangan. The property features free WiFi. The accommodation is equipped with a satellite flat-screen TV, Blu-ray player, and DVD player. There is a seating and/or dining area in some units. Finally, there are no special travel trips required to visit Gili Island because in general, it is similar to Bali. However, it is always best to seek the recommendation of hotels and attraction. To get around in Gili Island is also very simple because there is no motor or car operated in the island. You can simply choose to ride a bike or use traditional transportation. Also, it is important to consider the right time when visiting the islands because, during peak season, the prices will be more expensive than other periods of time. And that’s it for now! 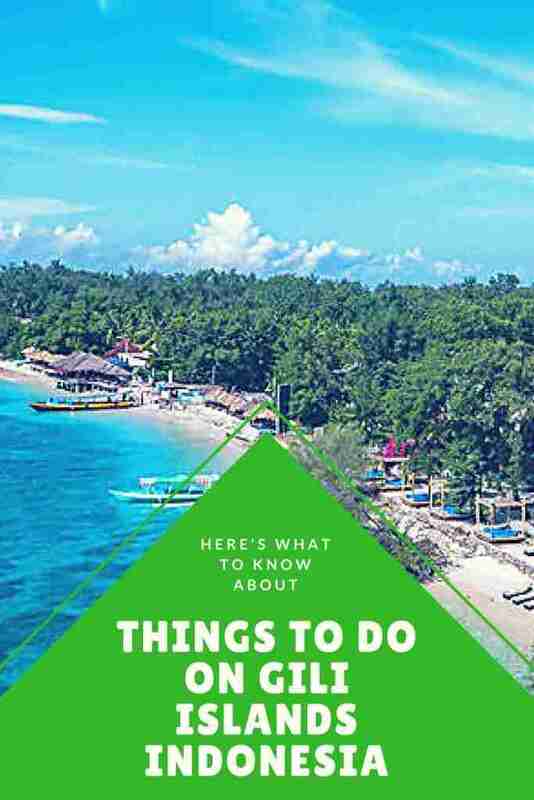 I’d love to know if this guide on the things to do on Gili Islands Indonesia has helped you. Let me know if you have any questions and let me know if you go. Traveling to Thailand What You Need To Know Before GoingWhat Are The Signs You Have Been Bitten By The Travel Bug?